The once-powerful Category 5 hurricane dropped to tropical storm strength early Monday after pummeling the state with wind, rain and storm surges. Former Hurricane Irma is losing steam as it leaves Florida and continues to make its way across Georgia. According to the National Hurricane Center, the once-powerful Category 5 storm dropped to tropical storm strength early Monday after pummeling the state with torrential downpours, storm surges and powerful winds. But even though Irma lost some of her violent strength, experts say she's still extremely dangerous. The storm caused flooding in Florida, Georgia and even the Carolinas. Millions in the region lost power, and the coast of Florida, Georgia and South Carolina braced for a potentially deadly storm surge. Multiple deaths were reported in Florida after the hurricane made landfall Sunday. 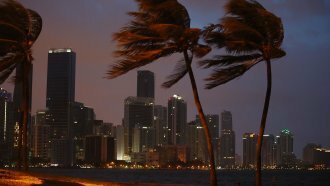 On Monday morning, nearly 60 percent of the state woke up without power and saw Irma had flooded the streets, toppled trees and left tons of debris. Before hammering the U.S., Irma wreaked havoc in the Caribbean, leaving dozens of people dead and causing major damage to several islands. The National Weather Service warned Florida residents to wait to start recovery efforts until after the winds die down and the roadways are cleared.